The bike path along Gulf Shore Way East is another good opportunity for a long off-road run on PEI. Located inside Prince Edward Island National Park, the path runs for 15 km one-way from Brackley Beach to Dalvay-by-the-Sea. Included in this route is 5 km along Robinsons Island Rd., east of Gulf Shore Way/Brackley Point Rd. 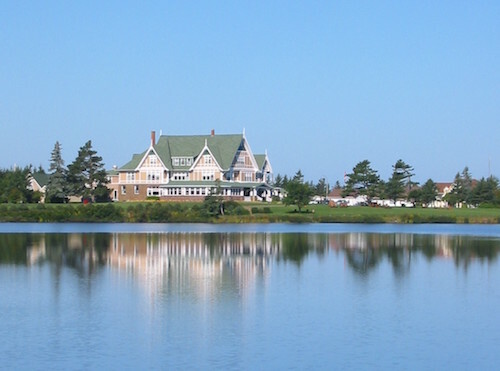 The Dalvay-by-the-Sea National Historic Site, a grand Victorian estate, was used to film the famed CBC production of Anne of Greene Gables. Note: Section in PEI NP requires admission fee. Robinsons Island Rd. Eastern 4 km is right on the water, with nice dune views as well. No bike path here, but quiet road. The 5 km between Brackley Beach and Cove Harbour Lighthouse in Stanhope. Pleasant, open running, with dune views and some water views. The 5 km east of the lighthouse are a bit more interior and treed, but the views open up again near Dalvay-by-the-Sea. Add-On/Options: Spectacular run along Bayshore Rd./Rt. 25 in Stanhope. 4 miles of great views on a separated paved walking/running path. See route. Also, the Farmlands Trail offers a 2.7 km loop along fields, hedgerows and mixed woodlands. Official Trailheads located at Brackley Beach Complex and Dalvay Crescent.